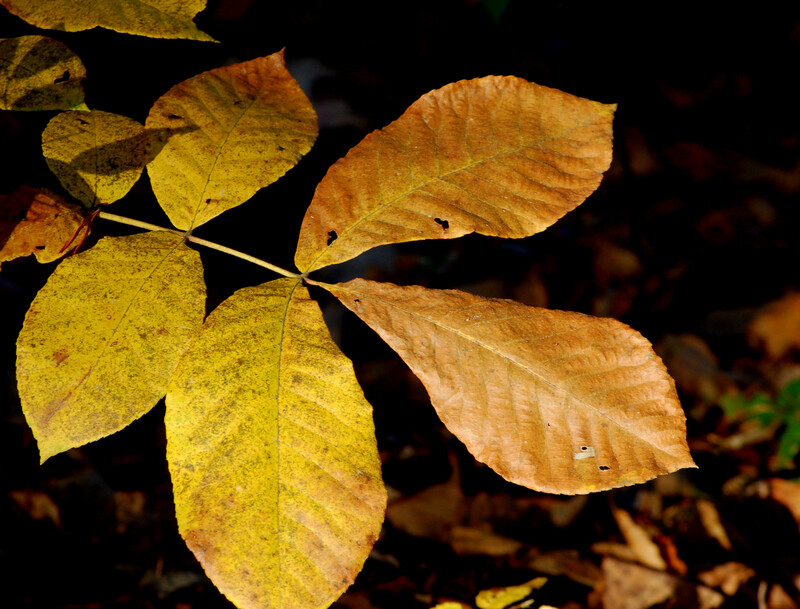 Monday, the 21st of October was a day with predicted warm temperatures. I elected to go out for a couple of hours to try to locate turkeys on the roost. 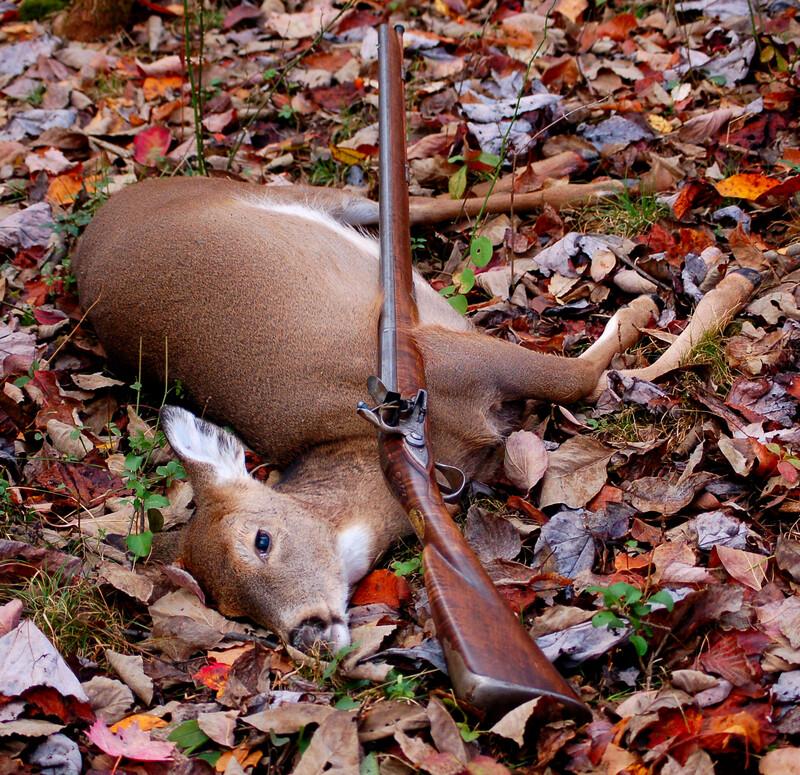 The early muzzleloading season for deer is in, but I didn’t want to hunt deer due to the warming temps. (I butcher my own deer.) The other reason I chose not to hunt was due to an unexplainable pain in my left leg. I walked about one mile only that morning seeing some deer (I, also, saw a pie-bald deer.) and turkeys. Today, however, I decided to chase deer around for my step-father, Bob and scout for turkeys. I was loaded for white-tails. I was armed with Jeremiah, my .62 caliber smoothbore. 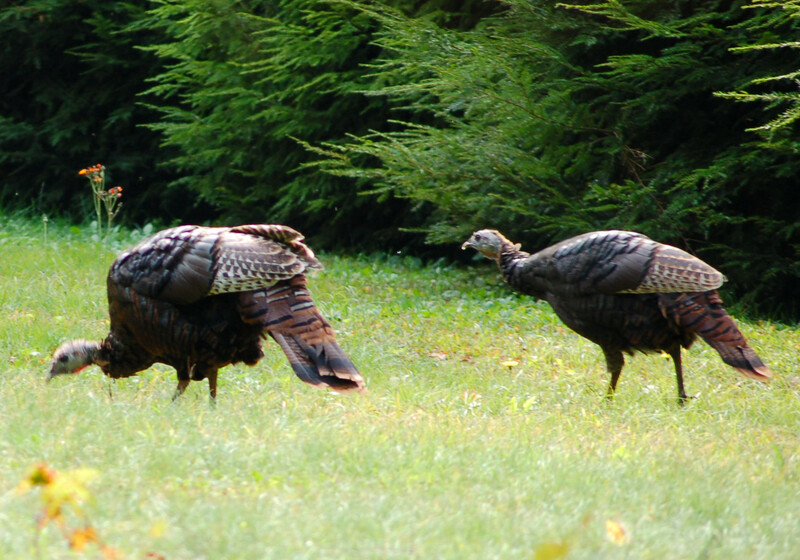 We bumped some turkeys from the roost while walking into the woods early. Bob posted and I walked about still in pain. Pain pills allowed this! 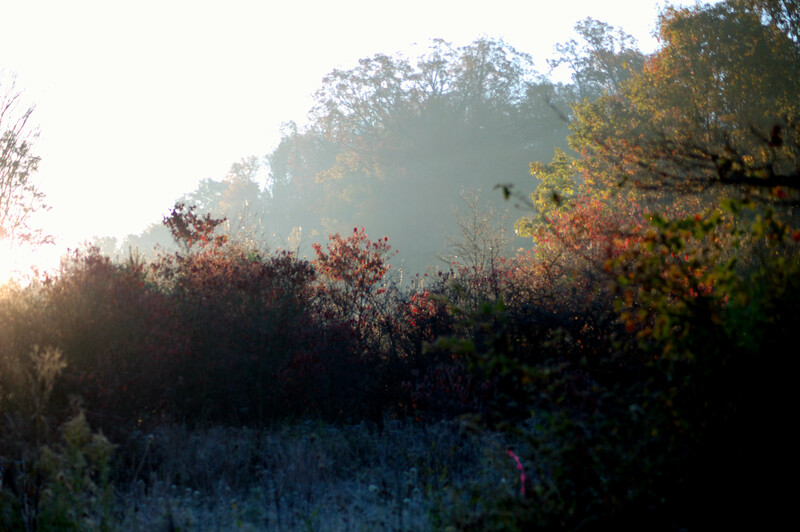 The irony of the morning was the hope of not taking a deer. I didn’t wish to butcher at this time. This was my first day to hunt deer and, of course, the pain. Bob would see a couple of small-racked bucks during his time on watch. Later on in the morning hours I met up with Bob. I told him to watch a different area and I would sneak around and hopefully move some deer past him. I was sneaking around and could see a doe about 80 yards from me. I closed the gap to about 50 yards. I could see the deer and had a shot, but allowed the deer passage. I saw this same deer three more times in this brushy area, but it eventually went the opposite of Bob’s stand. 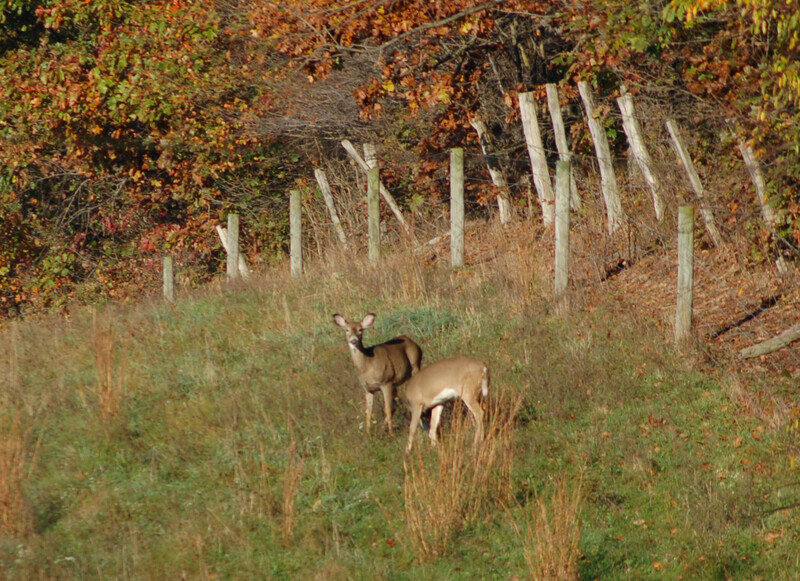 Bob and I were sneaking down a gas well road and saw another deer and later saw two more. I asked Bob if he was interested in climbing the hill. I figured we may be able to circle the two deer. The plan worked! I spotted the two deer feeding along below us and gave Bob the shot. He missed. We spent about an hour searching about just in case. 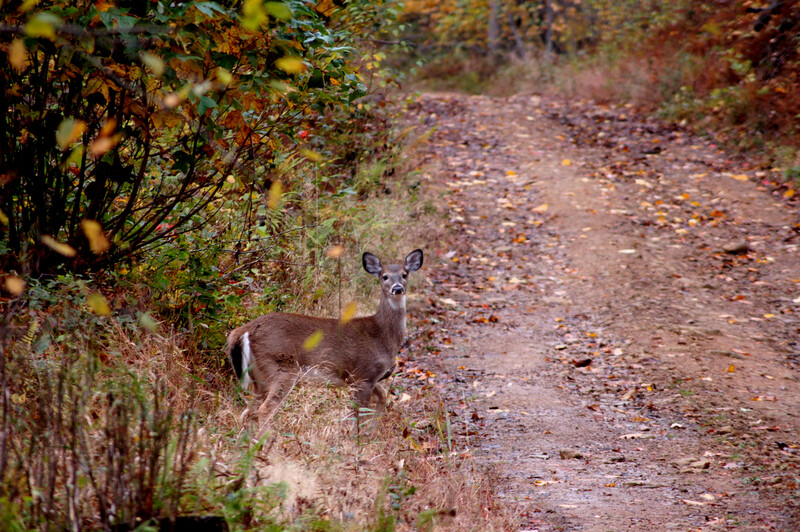 I had Bob walk a gas well road and I went farther uphill and searched for the deer. I eventually spotted a deer in the crab apples. I called Bob via cell phone, but had to hang up quickly. I was going to try to move the deer to Bob. The deer turned and started walking towards me. The thirty yard shot was true. I wasn’t trying to take a deer this day. I was just flowing through with my heritage I guess. I passed up four shots. The hunter mode kicked in and my first tag was filled. The shot was at noon. I saw turkeys, several grouse and lots of squirrels. 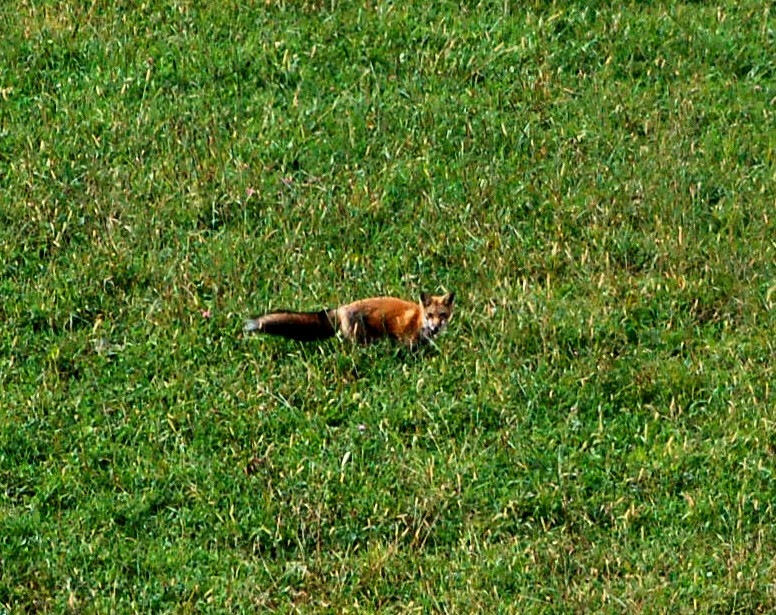 I saw one red fox as well. 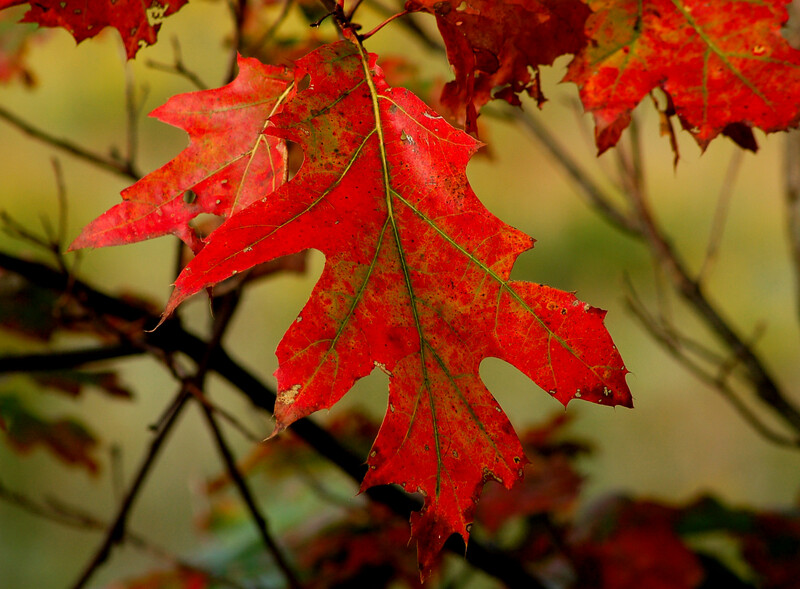 The fall season is upon us again in Western Pennsylvania. The temperatures are cooler and more comfortable. the insectual torment is lessoned. (I just made up a new word and I like it!) 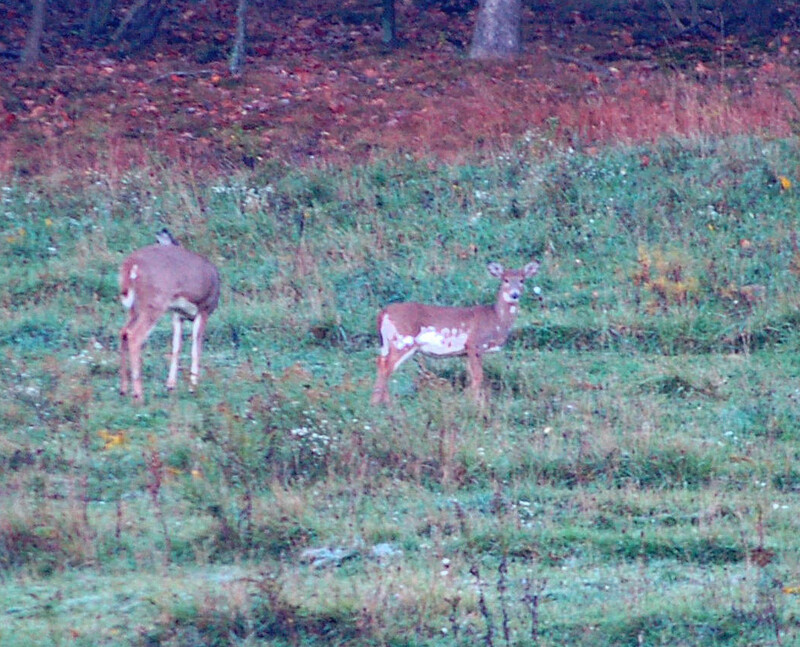 Wildlife, also, feel the changes as the white-tail rut increases in earnest! This is obviously by the number of deer being hit along the roads. Please, watch the sides of the road for approaching deer. 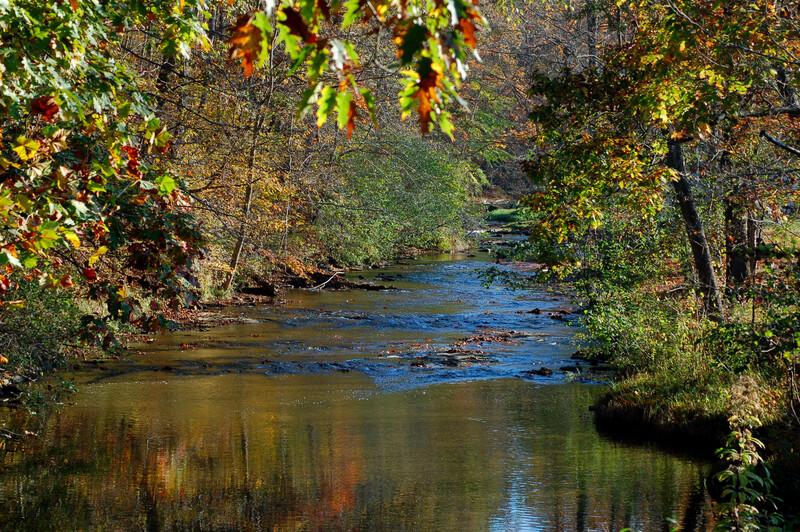 Earlier this week I elected to head for a section of Cherry Run to see what critters I could see and observe the colors. , also, wanted to check how big a new strip job was and the effects it may have on the hills and hollers. This four or so mile hike produced five deer sightings. I saw squirrels and many species of bird life. I noticed the first junco of the season. This little “snowbird” is always a joy to watch in the forests and around my feeder over winter. After the walk, I stopped by unannounced to visit a friend, Randy Tost. We had a nice visit and a sad one. The doctors confirmed his illness. We had all hoped these results wouldn’t be reality, but it is what it is. I was very much surprised to hear Randy is now on Hospice. We had some laughs and shared some thoughts. My drive home was quiet. 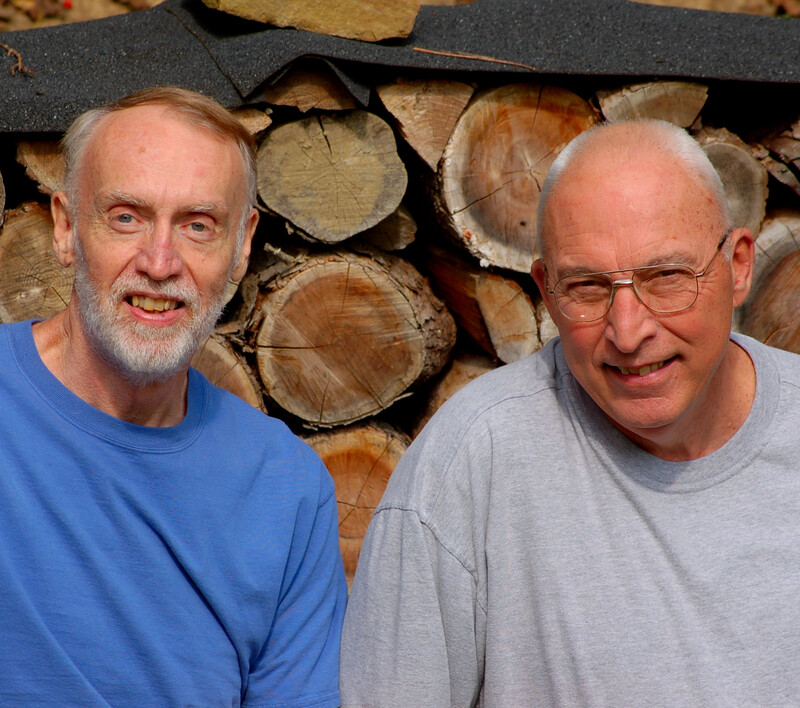 Randy (left) and John Helinski from an earlier visit. Early Friday morning, I traveled to an area near Pine Creek and a few miles from the Village of Echo. This morning was much cooler and 20 Mile per Hour gusts further cooled the air. 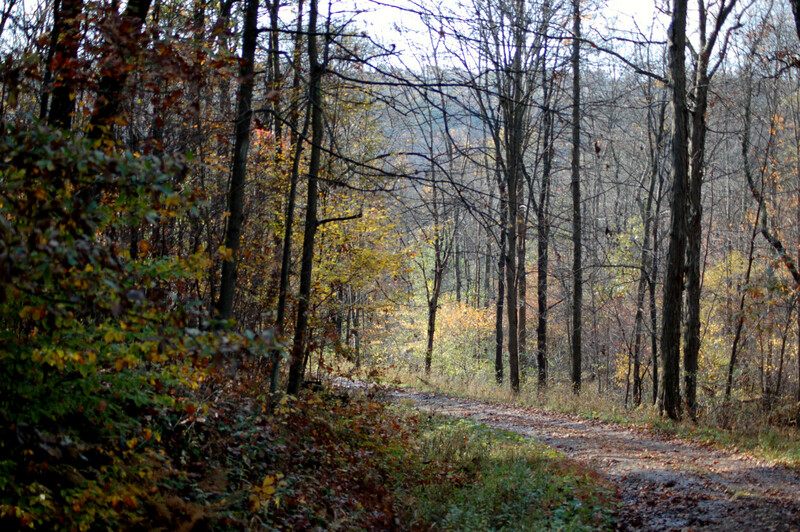 I hiked primarily along old abandoned roads and gas well roads to avoid the chance for ticks. I will be hunting soon and I dread the constant search for those small critters. However, the morning did produce a number of close deer sightings. 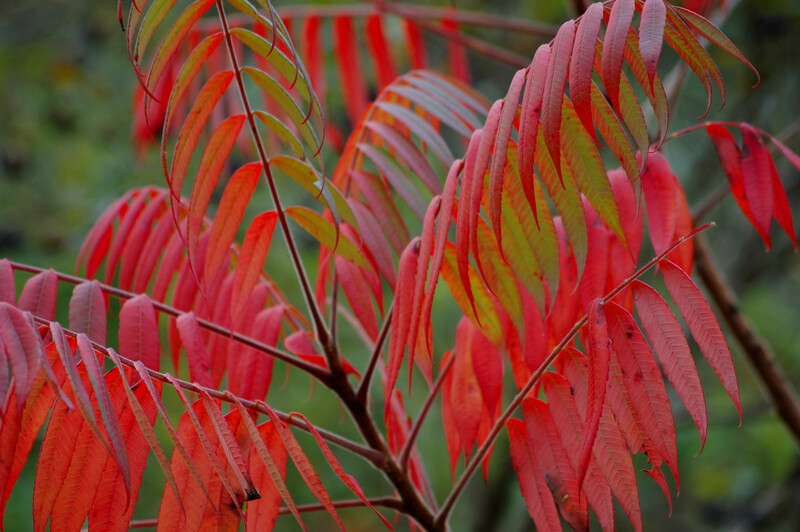 I had turned the camera to auto-focus for a certain photo. I turned to continue the hike and soon saw a very nice buck with an impressive rack, The seconds to realize my camera’s setting and change it back to manual caused a failure for a great photo. A saw 14 deer in total this day. 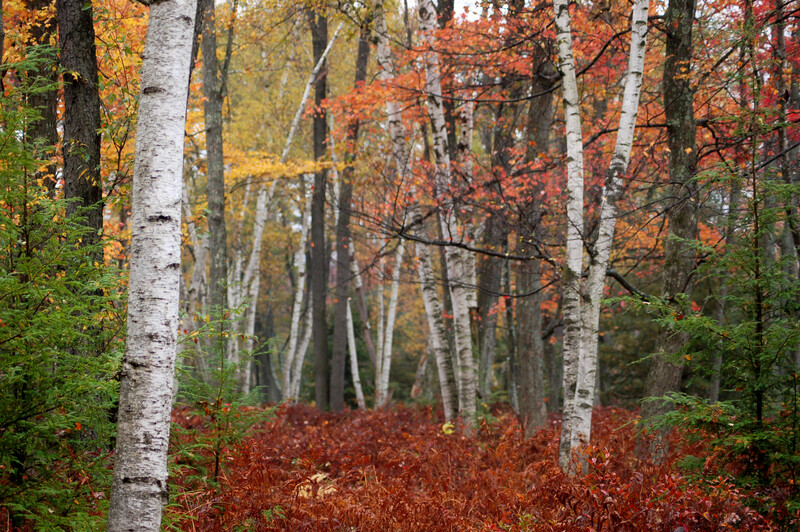 I was blessed to see some beautiful landscapes and fall colors. 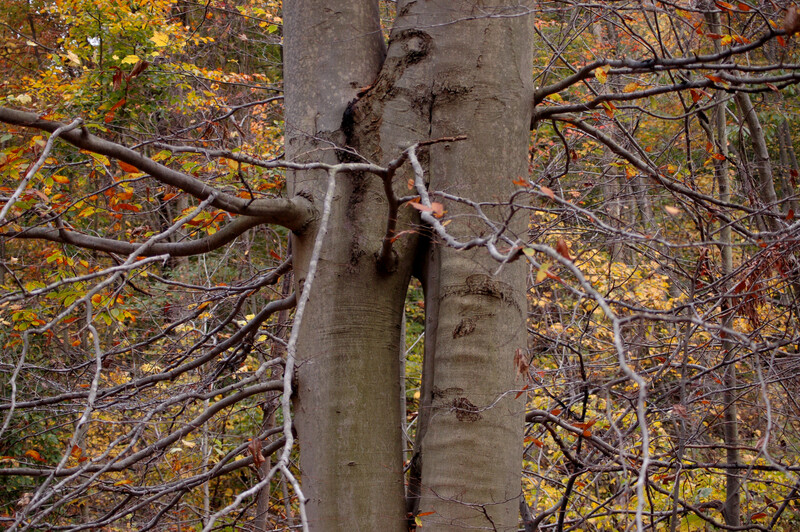 Two beech trees in love! 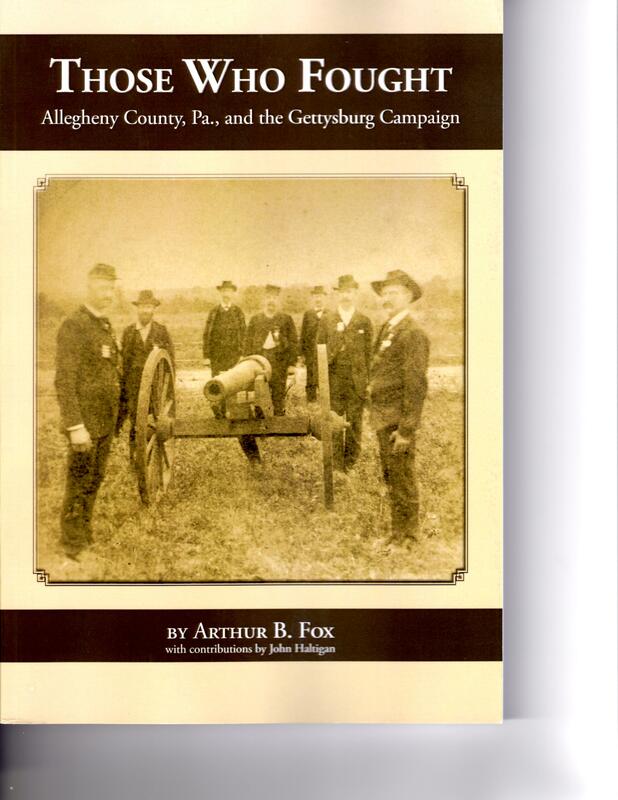 The recently published Civil War book entitled, “THOSE WHO FOUGHT Allegheny County, PA., and the Gettysburg Campaign” is now on the market. If you enjoy educating yourself with Civil war related writings this is a book you need to check out. THOSE WHO FOUGHT was written by Arthur B. Fox, M.A with contributions from John Haltigan. My friend, Robert “Slim” Bowser and myself had the honor of meeting with these two historians, as well as, Tom McMillan. (Vice-president of communications for the Pittsburgh Penguins.) The meeting involved becoming acquainted and talking Civil War and the status of this book. The writings of the book features information on the various regimental units from southwestern Pennsylvania who had fought in the Gettysburg campaign of 1863. Men from my native Armstrong County were involved. One of my ancestors was with the 63rd Pennsylvania at the Peach Orchard. Other points of interest in the 202 page book are: care of the wounded; regimental action summaries; maps; public interest stories; over 60 photographs; past Gettysburg reunions; placement of monuments and much more. Recently a very good friend, Randy Tost has been having some health related issues. Last Monday, September 30, Randy invited me for a visit to talk and laugh and meet another very good friend. John came to visit in regards to this health issue to support his best buddy. His friend is John Helinski currently living in Alabama. 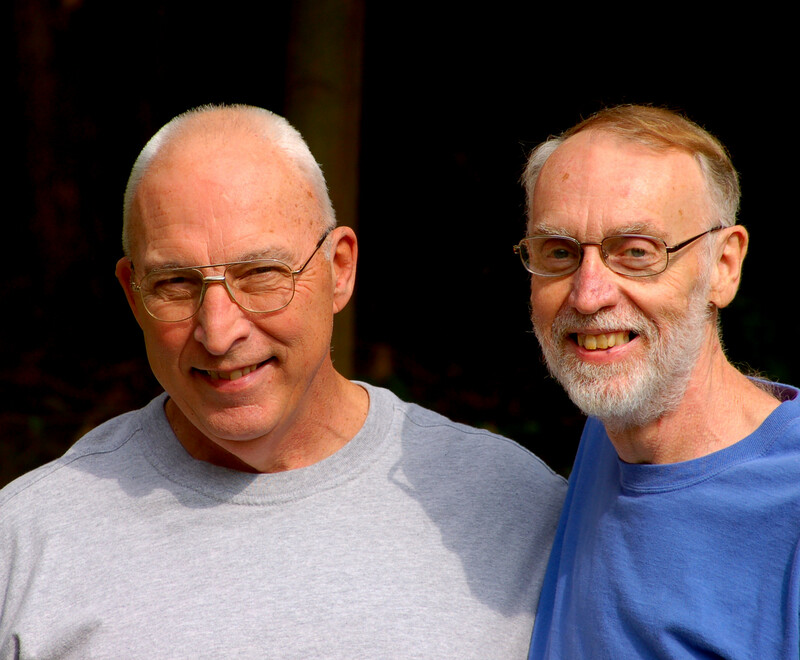 John and Randy met many years ago and became instant friends. This friendship has survived all those years despite the great distances. 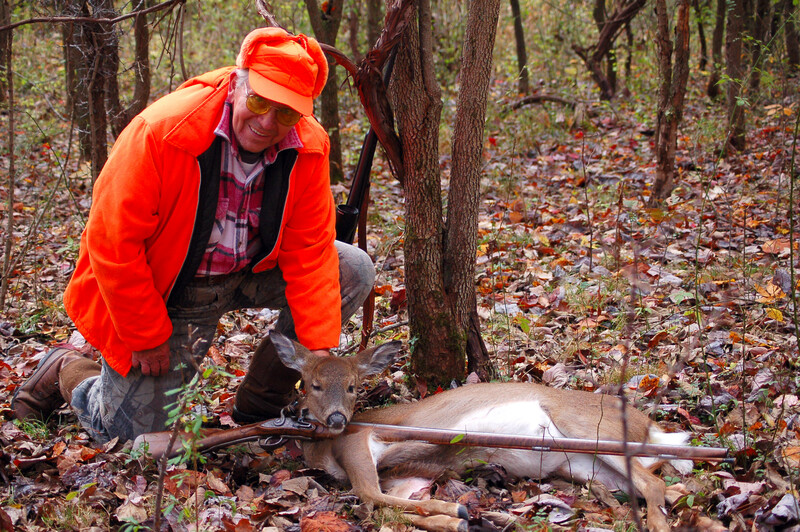 John, who is referred to as Big John returns annually to hunt deer on Randy’s property. John and I hit it off immediately as if we had known each other for many years. I like him! John and I are not giving up hope for a complete healing of Randy. Randy is hoping to get out to hunt deer some later this year too. Either of these two gentlemen I would have considered a blessing to have as a brother. I respect them and admire them dearly. I had been planning an adventure to the 975 acre Marion Brooks Natural Area for quite some time. (Southeast of Medix Run, Pennsylvania. 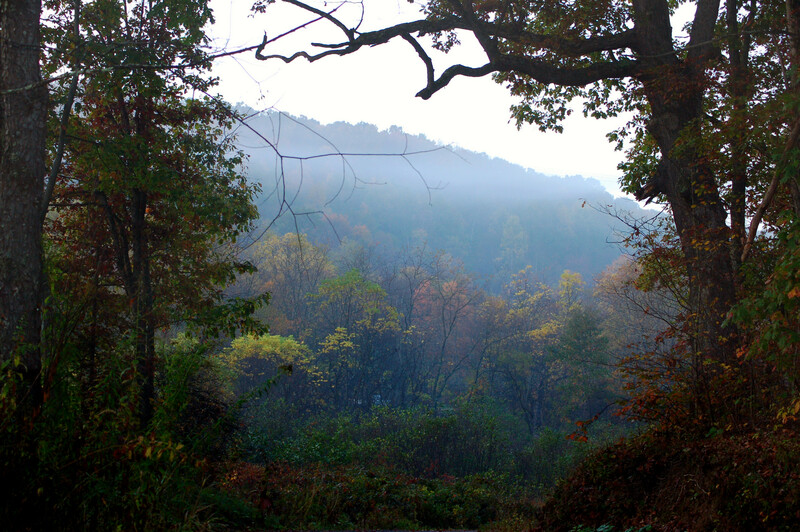 )This site is very unique to Pennsylvania. 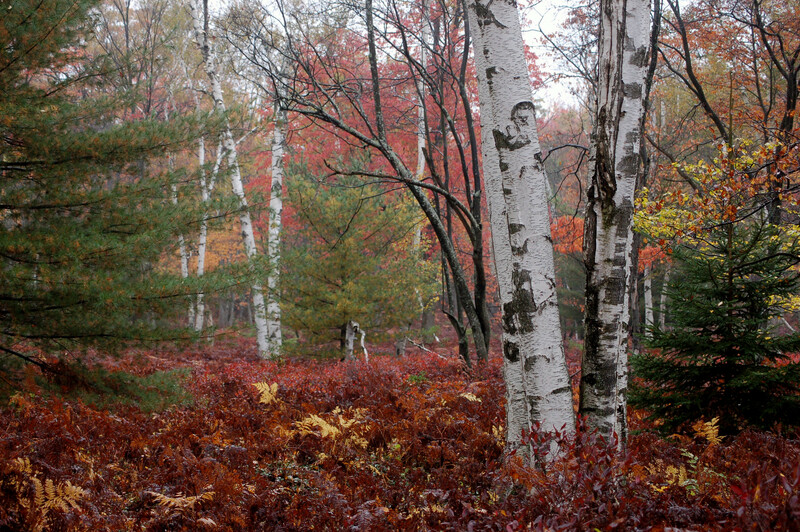 The forests of northern Pennsylvania are a typical mixture of oak; hemlock; maple… but this is a special area consisting of many White Birch. Typically this specie is more common farther north as northern New York, etc. I know of a couple of sites locally but not very large with this specie surviving. 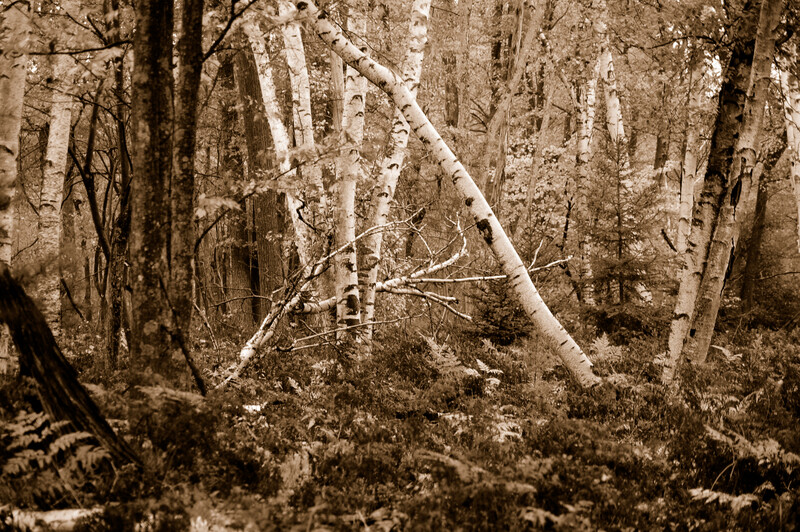 Many years ago, my neighbor Bob Bullers showed me a site of many white birch and a clear moving water source where a beaver had built a dam with birch. Native brookies could be viewed in the dammed-up water. It was beautiful. I had hoped my memory and search would find the same place. It wasn’t! Several factors were involved with planning this particular day. (October 4) One was Laurie was away visiting her aunt near the Poconos. Another was the timing for the birch should be yellowing at this time and the third reason was words of tropical storm Karen possibly heading into the northeast next week. We could get rainy and windy weather conditions depending on her path. I was up at 4:30 A.M. and headin’ northeast by 5:30. I arrived on site around 7:40. 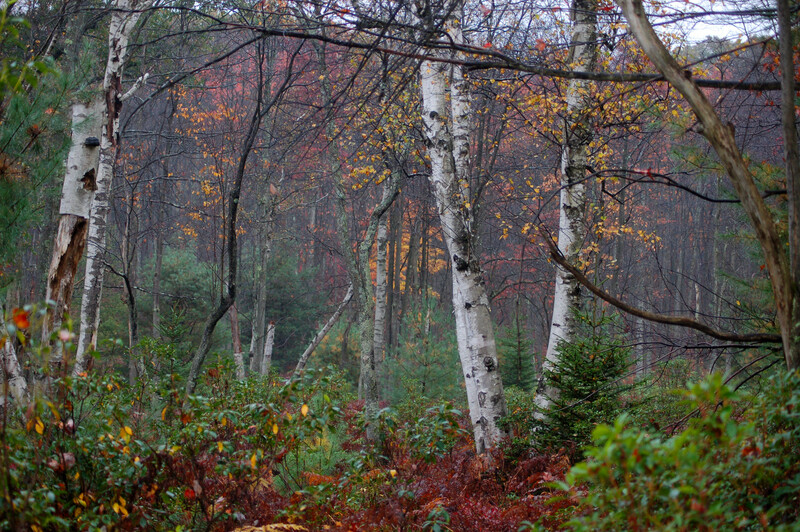 The forests were wet from yesterday’s evening rains. The waist-high Bracken ferns were numerous and soaked. I elected to walk the Losey Road for over a mile when rains began. The weatherman was predicted a good day for the most part. I turned and the rains soon stopped. I made my first mistake of the morning! 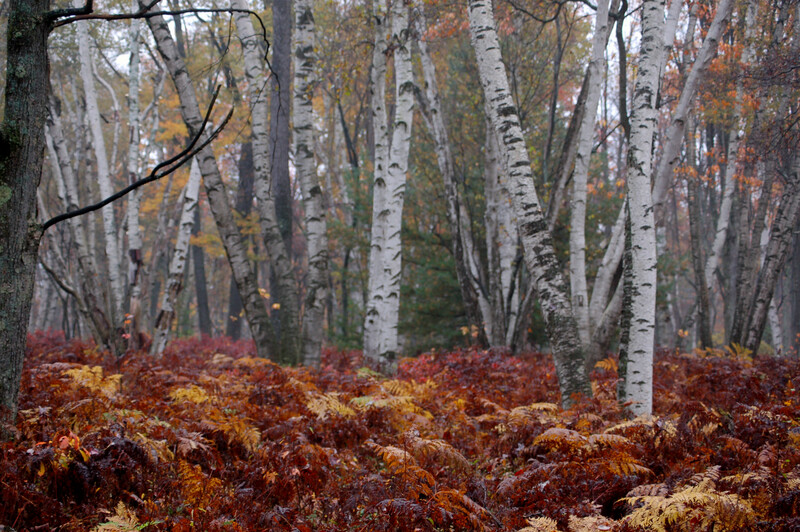 I decided to enter the woods here and circle around and into the white birch growth. (I altered my plans without much thought.) Second mistake was that I didn’t put the state forest map in my shoulder bag. (I traditionally do not hike off-trail without a topo map and I didn’t have such a map.) The third mistake was that I was so intent on photography that I didn’t watch my surroundings well. I always carry fire-making methods with me; knife and two flashlights just in case! (I took my friend Ruger with me too.) Oh well, I had some lessons that I relearned! As I was walking about I could hear a roar of either high winds or hard rains. The rains came quick and I perched tight to a large tree, but within moments I was soaked from every hair on my head to the bottom of my feet! The only place that was dry were my arm pits and the waters soon wicked around them too! I was walking about looking for great photos scenes. I exited the birch area and somehow, after turning left, walked slightly off my desired course. I would come out about a mile or so north of where I wanted. I spotted some camps and talked with two utility workers. They said I wasn’t way off but it would be a walk back to get there. They told me to get in and they would drop me off. The walk proved interesting for I removed another specie from my “Bucket List.” I was tramping along when I saw a dark-colored snake. 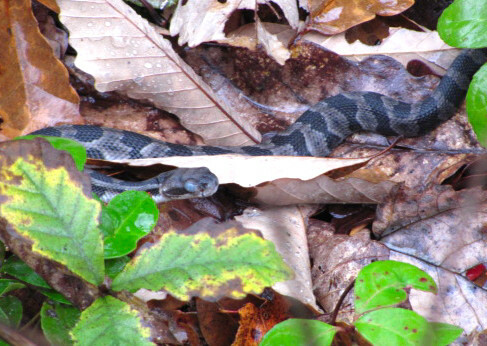 A second later I realized I was seeing a black-phased Timber Rattlesnake. I was about four feet from the snake. I began taking a few photos and noticed several young rattlers. I was elated! 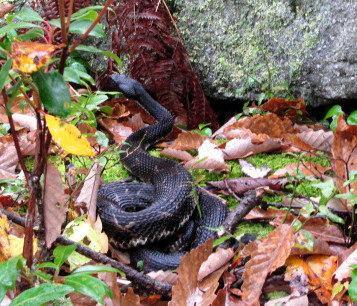 I touched the adult snake with my walking stick and I heard the rattles too. Other wildlife species I saw throughout the day were plenty of deer; a couple of distant elk; two separate flocks of turkeys and several squirrels. I was a great day despite the couple of mishaps.